Security is a big issue for both domestic home owners and those with commercial property, and it is vital to ensure you have the best solution available. Of course, budget is an issue – especially for owners of larger properties or complexes – and that’s why, at Topfence, we are committed to providing the very best, most secure and most durable palisade fencing at the right price. We deal only in top quality fencing and gates – the latter tailored to your individual location – and with many satisfied clients you are in good hands with us. Why should you choose Topfence? We are a local company providing fencing security solutions to addresses in the Western Cape, and all our materials are sourced locally. So, buy from us and you are also supporting businesses in the region. Furthermore, our fencing design is not only the strongest and most durable around, with securing pales at the base for added protection, but it is designed to look good too, so you get enhanced security and an attractive design. Have a look at the website for some examples of our recent work, and we are sure you will be impressed. 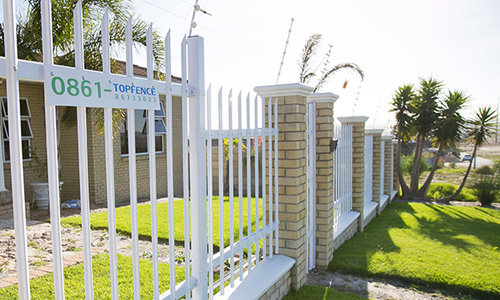 Topfence is the number one supplier in Cape Town, and as such we have a reputation for quality work at great prices. We will work with you to ensure your fencing follows the natural contours of the land for best effect, and we are happy to talk to you about any specific requirements you might have. With clients including everything from private homes to full complexes we are sure to be able to help you, so why not fill in the simple online form with your details and send it to us right now, and we will get back to you as quickly as we can. 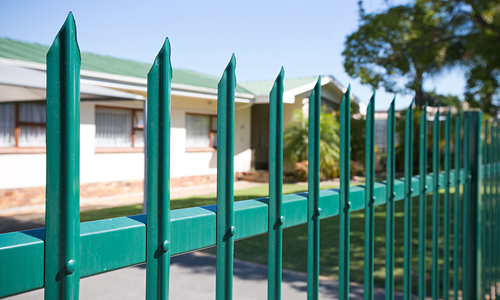 A fence is an excellent addition to any security protection you may have, and when it comes to the most effective solutions palisade fencing could be the way to go. Attractive, durable and offering excellent protection, palisade not only adds to your security system but also enhances the look of your property, and works well for domestic properties as well as commercial buildings and complexes. At Topfence we have the very best and most protective designs available, and we also believe our prices to be the best you will find. Topfence is the number one supplier of palisade fencing designs in the Western Cape region, and we not only supply fences but also gates. We can offer various types of gate – pedestrian and vehicle access swing gates and a choice of sliding gates – each of which will be manufactured to fit the specific site, and we also offer you palisades with two different spears so you have a choice of style. Furthermore, we use only the best material from local producers, so you are guaranteed quality at every turn. With fences designed to match the contour we promise attractive and effective fencing whatever your requirements. Dedicated to providing the best and most effective fencing, Topfence also takes care to ensure that our prices are sensible. We know that fencing for large areas – shopping malls and hospitals for example – can be extensive, so we keep our rates as low as we can. With many satisfied clients having already added to their security systems by installing our palisade fencing you can be sure that yours will be effective in deterring intruders, so why not get in touch with us right now, and one of the Topfence team will be more than happy to answer any questions you might have. With crime levels on the rise it is important to ensure your property is protected; expensive and sophisticated alarm systems are all very well, but do they actually keep intruders out? In fact, an alarm system will only inform you that an intruder has breached the perimeter of your property, and by then it may be too late! That’s why Topfence offers a choice of high quality, durable and effective palisade fencing systems that not only do the job, but look great. With excellent prices and many satisfied clients, we are proud of a reputation for great service. Why turn to Topfence for your fencing solutions? Quite simply, we are the leading provider of quality fencing in Cape Town, and we use only the very best material. Our fencing is made from materials sourced in the Western Cape so you are helping local providers, and is designed to be string and resistible to cutting and other damage. Indeed, we believe our design to be the strongest around. We also supply gates, which are designed specifically to each customer’s location and requirements, and which also provide maximum protection. At Topfence we are dedicated to providing the best and most secure palisade fencing available, and we can work with everyone from domestic houses to complexes, shopping malls and other large buildings. We are happy to talk to you about any specific requirements you might have, and believe that we are the best in the business in the Western Cape region. With a choice of two spear types and a design that is shaped to follow natural contours we are the people to come to for attractive, effective fencing solutions, so fill in the online form right now if you are interested, and we will come back to you and discuss your requirements.